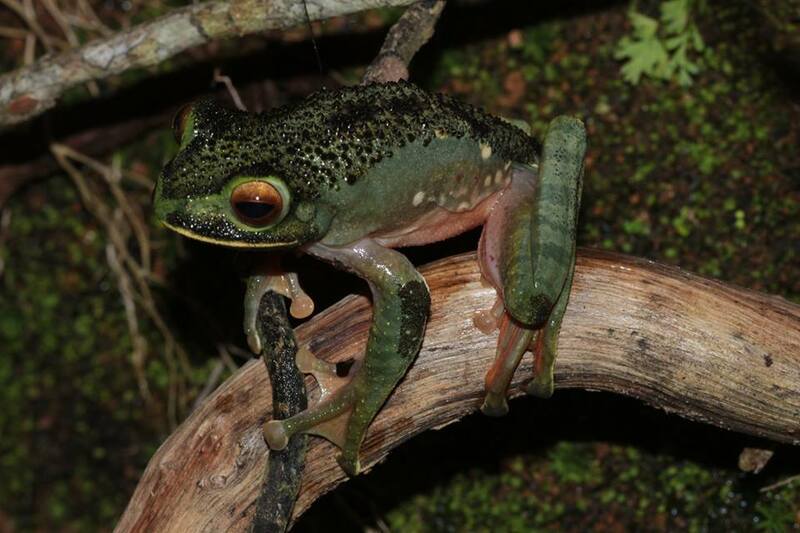 When I passed in the Vohimana Forest, East Madagascar, I had the exceptional luck to find a considerable number of white-lipped treefogs, Boophis albilabris. This anuran is really particular since, first of all, it is large (up to 81 mm), and then because it shows a very variable colouration, passing from brown to green, with a number of irregular spots. The most interesting thing, or at least one of the most interesting ones, is that during the breeding season males develop pointed tubercles on the back, breast, underside of legs. Part of these tubercles form the so-called nuptial pads, which are used to embrace females during the amplexus. Then, B. albilabris aggregate along streams, especially when cyclones arrive. They are representatives of the so-called "explosive breeders": they mate in just 1-2 nights, when they become visible in hundreds of individuals, after which they disappear as they appeared, like ghosts. During these aggregations they emit low-frequency vocalizations and engage in real battles, with many males around just one female. In this they are somehow similar to what happens in Europe with the common toads Bufo bufo. In Vohimana I found several individuals, and they were really visible. Most likely this was due to the presence/arrival of cyclones, typical meteorological phenomena of the tropical area. In fact, a few days later the strong tropical storm Eliakim stroke Madagascar. Those beautiful Boophis were just ambassadors of its arrival.